Product #15815 | SKU Z-CHTH | 0.0 (no ratings yet) Thanks for your rating! This helmet kit includes the same Helmet and 3” Z-Rail as the Tapped Handle Kit, but the handle features two unique cold shoe mounts instead of the screw holes. The cold shoes (one vertical & one horizontal) are secured with Zacuto’s new quick release clamp onto the shoe of your accessory. 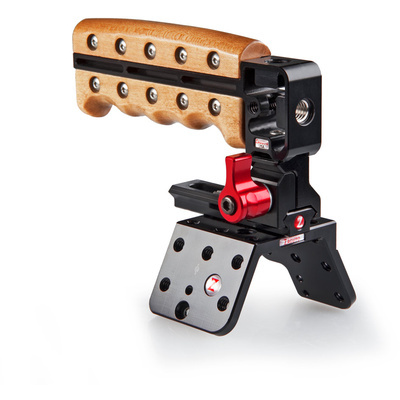 You can mount two cold shoe items at once with a half turn of a Zacuto lever. No unnecessary winding of the annoying plastic round tie down wheel! This new system is a convenient clamp that cannot come undone. It a totally new way to create a rock solid coldshoe connection. The Helmet gives you multiple mounting screw holes both horizontally and vertically. The QR Tapped Handle is a quick release handle that will work with any Z-Rail to give you a top handle with two ? 16 screw hole mounts. The screw holes can accept a ¼ 20 using a brass collet. The top handle itself is hand-tooled fine three-quarter maple.